Much is often made of the deregulated electricity market in Texas, whether the discussion and interest comes from Texas residents, interested journalists, various politicians, or consumer advocates. The market has now been deregulated for a decade and has achieved a certain level of maturity that comes with age. The market has not found this level of maturity without hiccups and bumps in the road along the way. Many of the complaints and concerns associated with the development of the Texas market have been around the general price of the power for residential service. At times, this concern has had merit. While that may be the lasting impression, or at least the lasting talking point of the critics of the Texas market, that position is often misinformed and even outright wrong, as it is now and has been for two years. For pricing, not only can customers currently lock-in a low price point for their power, but they can lock that price point in for an extended period of time, often as long as 24 months. Promotions within the market currently include offers to donate to charity by the provider for each new sign-up, retail gift cards, and bill credits. Reward programs include anything from free companion airfare, a free month of electricity, cash back programs, and things of that nature. Beyond these promising components to all buyers within the Texas market, overall prices right now are, simply put, a fraction of most regulated electricity pricing. There are two major causes for the significant price difference between markets. The first is basic – when market demands require or allow a pricing move in a free market, the market’s prices will move accordingly. Therefore, when natural gas prices go down and stay down, a deregulated market’s electricity price offers will also go down. The second reason for the price disparity between markets is that when prices rise and stay high, regulated market monopolies often file for pricing increases. These increases appear merited and get approved by a state’s governing Public Utilities Commission (PUC). The problem with this behavior is that when prices move downward on the underlying commodity (in most electricity markets it’s natural gas), the regulating pricing doesn’t have the flexibility to move downward. The regulated prices stay high until, if prices appear depressed for an extended period of time, another rate case is filed and approved for the monopoly. These downward shifts do not occur very often, not surprisingly. So what of the pricing between markets, then? Let’s look. In Texas, we considered 4 major markets – Houston, DFW, Austin, and San Antonio. Houston and the DFW Metroplex are governed largely by deregulated market forces, while Austin and San Antonio are supplied by regulated entities. In Houston, there are 15 Retail Electricity Providers (REPs) offering plans to customers below 9 cents/kWh at usage of 1000 kwh. Prices in this market go as low as 7.5 cents/kWh and most providers offer a promotion, a rewards program, or both. Green choices starting at 9 cents/kWh are also plentiful. Dallas offers even lower pricing than Houston, with over 20 REPs offering plans at or below 8.5 cents/kWh all the way down to 7.1 cents/kWh for some plans. Again, most providers offer a promotion, a rewards program, or both. Green choices starting at 8.5 cents/kWh are also plentiful. Prices for both of these markets can be verified and reviewed at www.powertochoose.org for any customer in those markets looking to switch. Prices include all fees for usage, delivery, transmission, billing and customer service. The story in Austin is solid, if less spectacular. Austin remains one of the lowest-priced regulated electricity markets in the country. September pricing, with all fees included, comes out to 9.938 cents /kWh. Austin Energy has filed a rate case for a price increase with the Texas PUC, so it will be interesting to see how long their low prices hold. Green pricing is essentially an additional 2.074 cents/kWh, bringing the total rate to 11.985 cents/kWh. 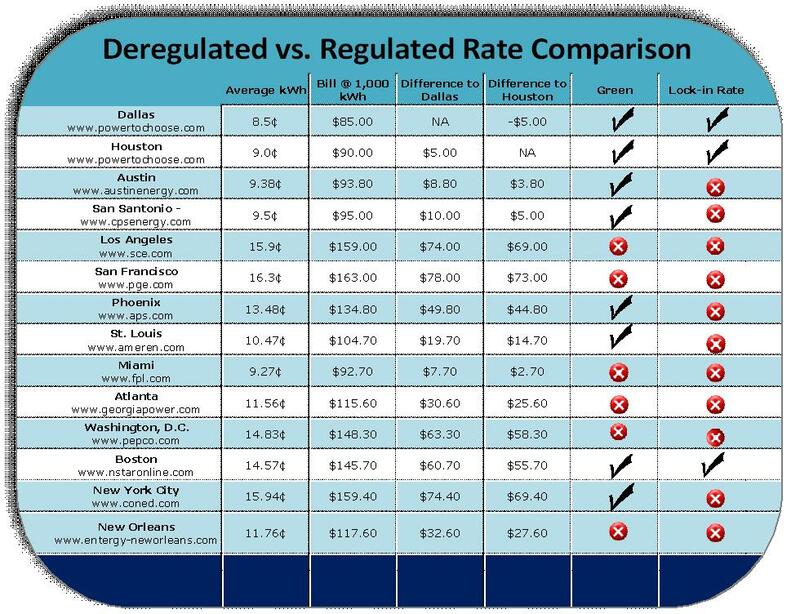 San Antonio also has one of the lowest prices of any regulated market in the entire country. With all fees included, City Public Service offers 9.5 cents/kWh to its customer base. Green pricing is an additional 3.65 cents/kWh times the level of participation with the customer gettting credited back for their fuel adjustment charge according to the level of participation. So, for a 100% wind plan, the final rate for September comes in at 11.855 cents/kWh. Note that Austin and San Antonio do not offer choice to their customers. Austin Energy and CPS also do not offer rewards programs or sign-up discounts. Moving on from the state of Texas, the picture gets far more bleak for regulated markets. In Los Angeles, Southern California Edison (SCE) offers rates between 13.3 cents/kWh and 16 cents/kWh depending upon the residential area surrounding greater LA in which a person lives. The California PUC puts SCE’s average bundled residential rate at 15.9 cents/kWh for 2010. SCE does not appear to offer any green options according to www.sce.com . Things get worse in San Francisco, where Pacific Gas & Electric has prices averaging out at 16.3 cents/kWh. More surprising than the significant price jump compared to other markets is that in a region like the greater San Francisco/Oakland area, PG&E does not appear to offer any green options for eco-conscious customers. Moving east on the map to Phoenix, where Arizona Public Service is the monopoly, the pricing in one of the hottest but driest of all US markets comes in at 13.48 cents/kWh. Places like Phoenix with considerable electricity demand, much like Dallas or Houston, having higher rates than other markets because of the economic basics of supply and demand is not surprising. However, the sizeable gap in pricing between Phoenix and Dallas/Houston is stunning. Green energy is available at 4 cents/kWH more. St. Louis, with the publicly traded Ameren as its monopoly, gets a little better for customers at 10.47 cents/kWh during the summer, which still represents more than a 15% increase in pricing over Houston. On 9/3/2010, Ameren filed a rate increase request that would increase rates across all rate classes by 11%. Customers can add a block of 1000 kWh green energy for $15/month. One of the more similar markets to Houston, both temperature-wise and humidity-wise, is New Orleans. New Orleans is a regulated market with the publicly-traded Entergy as the monopoly electricity provider there. New Orleans is currently priced at a dramatically higher level than any deregulated market in Texas. They offer power, non-green of course, to customers at a rate of 11.76 cents/kWh. That’s more than 30% higher than the average in the Houston market. Moving on and looking at Miami and that area’s monopoly, Florida Power & Light (FP&L), the picture improves. Pricing is set at 9.27 cents/kWh for Florida Power & Light customers. FP&L’s parent company also owns Gexa Energy, a REP in Texas, and offers pricing in Texas for customers in competitive areas at a rate below the Miami market. While it’s not clear that FP&L offers green options to their customer base, they do offer rebates and incentives to customers for different energy efficiency programs. Atlanta, or “Hotlanta” as it is often referred, is a market covered for power by publicly traded Southern Companies subsidiary, Georgia Power. This entity does not display pricing that is easy for a typical residential customer to understand. With some work on a calculator and digging through the provider’s site, it appears the average price/kWh at 1000 kWhs is roughly 11.56 cents/kWh. Atlanta is a hot city, but it isn’t nearly as hot or humid as Houston. It is difficult to understand why pricing for Atlanta is so much higher than that of a city with more significant demand issues such as Houston. Atlanta residents can order green power for an additional $35/month per 1000 kWhs, bringing the green rate to 15.06 cents/kWh. Washington, DC is higher priced than even Atlanta. PEPCO offers prices to customers in this market at 14.83 cents/kWh. It’s not very clear that green energy is an option in the DC market based on a review of the PEPCO website and phone calls. Boston is another market with extraordinarily high power prices. Customers can expect to pay an average of 14.57 cents/kWh to NStar in the greater Boston area. NStar does offer a 100% green option for $13.96 more per month for a home using 1000 kWh. It is difficult to determine what is driving prices in this market to such an extreme level. New York is a semi-deregulated market for power. Prices in this market are also unfortunately difficult to determine as a result of the way New York allows for, and restricts, competition. The pricing appears to be a combination of the Consolidated Edison transmission, distribution, and billing fees and the price of power generated by numerous suppliers within the market. When considering all of those figures together, ConEd’s rate to beat comes to 15.94 cents/kWh. A consumer can add green to that for 2.5 cents/kWh more, making it a tough market if a customer sticks with the incumbent. We attempted to review pricing for Chicago within this analysis. Unfortunately for customers in that market, there is no easy way to determine a real price/kWh. Finding a price for this market appears to require review of a 450 page rate filing by Commonwealth Edison. Even through conversation with a customer service representative in that market, we were unable to determine an actual price/kWh. All rates were based on 1000 kWhs of consumption per month, which is a standard measure used in the markets where the debate over deregulation has remained the hottest, Texas. Taxes were avoided and all other visible and available fees for each market were calculated into the rate in order to arrive at true apples to apples pricing across the country. Rates for providers mentioned in the numerous comparison regions can be found on the provider websites listed below this article. The rates researched for all markets within this article were applicable as of September 20, 2010. The key in any spirited debate, such as electricity deregulation, is that observers get an honest representation of both sides of the story. Often times, that hasn’t been the case in the Texas deregulation story. Consider that the prices in the deregulated Texas footprint can also be locked in to protect from volatility of price movements, so this isn’t simply a snapshot comparison of what providers are offering in those markets today. Low pricing is available for years forward, no matter what outside factors play a role to any market. In summary, the situation in a maturing deregulated market like Texas for power is beginning to look a lot more like other deregulated service stories that have played out over the years, such as video, long distance, local phone, cell phone and high speed service. Competition breeds lower prices for customers, better customer service, and more innovation. Try finding any of that in the regulated markets mentioned in this story. Matt Oberle is the Founder and Manager of Texas Electricity Ratings, a consumer advocacy and comparison shopping website that operates in the Texas deregulated electricity marketplace. Matt has previously worked at Hewlett Packard, and before that he worked for 3 years at internet start-up and comparison shopping company, Houston based WhiteFence. While at WhiteFence, Matt worked with some of the biggest brands and service companies in the United States, including Comcast, AT&T, Time Warner, Dish Network, as well as incumbent electricity providers Reliant and TXU when deregulated electricity was in its infancy. Nicely written article, but I have some reservations. You state that “within the Texas market, overall prices right now are, simply put, a fraction of most regulated electricity pricing”; but I’ve found that some of the supposed low rates are merely introductory or come with a contract (usually 2 years) to “lock in” the elcetricity rate. All of the “lock in” contracts have a clause stating that only a change in law or a regulatory change can effect the price of the consumers electricity once they’ve entered the contract. That is one of the chief thigs I have a problem with. All pricing is primarily effected by regulatory change! In Texas, pricing is pretty much set by ERCOT under the watchful eye of PUCT, in order to reach the magic PTB. Any increase in cost that isn’t related to increased demand, would be due to fluctuations in the price of, at this point in time, natural gas. All the electric provider has to due is to file a petition with PUCT to increase rates and, if granted (small risk for the provider there),a “regulatory” change has just increased the electric rate; and there’s nothing the consumer can do about it because they signed a contract; one with a penalty fee usually in the neighborhood of $200.00 for breaking the contract. The kicker to me is that if the consumer didn’t have a contract, the process is the same. The provider files a petition with PUCT and the rate goes up. I guess the only real benefit to the consumer is that they can switch providers after a rate increase, provided they aren’t bound by a contract that “locked” in their rates; and they can find a provider that has a better rate without a longterm contract. From where I’m sitting, electric consumers in Texas are no better off than they were before deregulation. You’ve got some fair points. Some of the rates are based upon electricity promotional rates. But even the average prices after that promotional rate expires are still substantially lower than in most of the other cities in this article. And as for the ability for an REP to petition to increase a rate that is on contract, that is not something that happens or would be approved regularly. That is for specific instances, like when the cost of natural gas in 2005 went through the roof, and more than a handful of REPs went out of business because they were losing money hand over fist on their established customers. The PUC isn’t interested in passing rate petitions just because an REP wants to make more money on a customer. So that isn’t really a reasonable illustration of the REPs. They’re not just sitting in a room filing petitions to make money every few months, and even if they were, those wouldn’t be approved. I’ll tell you one way in which the consumers are flat out in better position than before regulation, and that is in the world of innovation. You might scoff at the idea, but now that there are competing REPs that can come in and improve processes and inefficiencies in their businesses, they can pass those savings onto customers, and they do, believe me. A lot of people might have a hard time accepting that, however, the companies that have continued to struggle the most in the marketplace in regards to pricing are the old incumbent REPs. Other guys have come in and improved the business efficiencies, as where the big old guys have struggled to innovate as quickly. They’re not used to having to make changes, or innovate, and in the past when they were losing money, they’d just increase the rates. Which they can’t do anymore, because other companies keep their rates lower, so as a result they continue to lose customers. If this were 1998, the rates would just go up and there would be no course of action a customer could take at all. Up until very very recently, Reliant’s rates were the highest in the market. What would happen if that was the only choice in provider a customer had? They’d simply have to pay the rate. Instead, there are options, and Reliant is forced to lower their rates. Of course, that doesn’t meant they won’t still attempt to funnel as many customers as possible to their higher rate/profit plans, like the Cap N’ Save. Are you aware of any states presently preparing to deregulate in 2011. Pennsylvania should be finishing their deregulation process by 2011, if that helps. I enjoyed the read and found the breakdown thorough and enlightening, given all of the noise over the last decade regarding deregulation in Texas and the pricing in other places. Excellent article and response to the earlier reply. It still seems to be in vogue to bash deregulation but more often than not the “bashers” are misinformed or behind the times. I would certainly much rather be living in Texas with the lower rates and innovation deregulation has brought to our state. I find your comparisons on electricity in Houston and San Antonio to be very erroneous. I have a house in Houston and San Antonio. Electricity in Houston has better rates than San Antonio. I would like to know why is SA not deregulated? The rates here in Houston are lower than SA. Is it politics or ignorance on the part of the population. I hope to get a response from you on your comparison. You do realize this article was written more than 3 years ago, and that a lot has changed since then, right? You also do realize that I am an advocate of deregulated electricity, right? SA is not deregulated because they opted out of the deregulation process when the rest of the state deregulated at the turn of the century, along with Austin and some other areas. It was a political decision more than anything, really, is what I believe. It’s also worth noting that there are sometimes physical reasons why electricity might be more expensive in one place vs. another. For example, New Orleans is in a ‘load pocket’. Sorry guys – but the $0.085 per kWh figure is wrong for Dallas, in my opinion. As is to get $0.085 per kWh – you constantly have to file an informal complaint with the PUC. The$0.085 is a misleader to get you to sign up and then when you start seeing the real rate, well try to call them and find you phone call after waiting and waiting get hung up on, in my opinion. So all is left is file a complaint – like I just did at the higher rate of $0.1298 and oh yes they automatically take the money form your bank account – cause that is part of the $0,.085 rate you have to fight for to get and to get out of the 12 month contract they want $250, in my opinion. PUC Complaint No:CP201502XXXX. So just about everything you wrote above is based on theory, in my opinion – as now we have little monopolies for a shorter amount of time – while the rest the rich get richer and the poor get poorer, in my opinion.